ItemE-01242 - Cache Creek House. ItemE-01243 - The Bonaparte River Valley 111 miles above Yale. ItemA-01559 - Barnard's Stage at Yale. For Soda Creek, Fraser River. ItemC-04391 - Farm at Soda Creek. ItemA-03570 - Spences Bridge, Cook's ferry, where gold was first discovered. ItemA-03900 - Lake La Hache [Lac La Hache], 114 miles above Lilloet [Lillooet]. ItemA-03928 - 13 Miles from Yale, B.C. The Alexandra Suspension Bridge, Fraser River, B.C. ItemF-04956 - Boothroyd Lake, 36 miles above Yale. ItemA-03573 - Rattlesnakes are very plentiful about this part of the country. A view on the Thompson River at the 84 mile post. 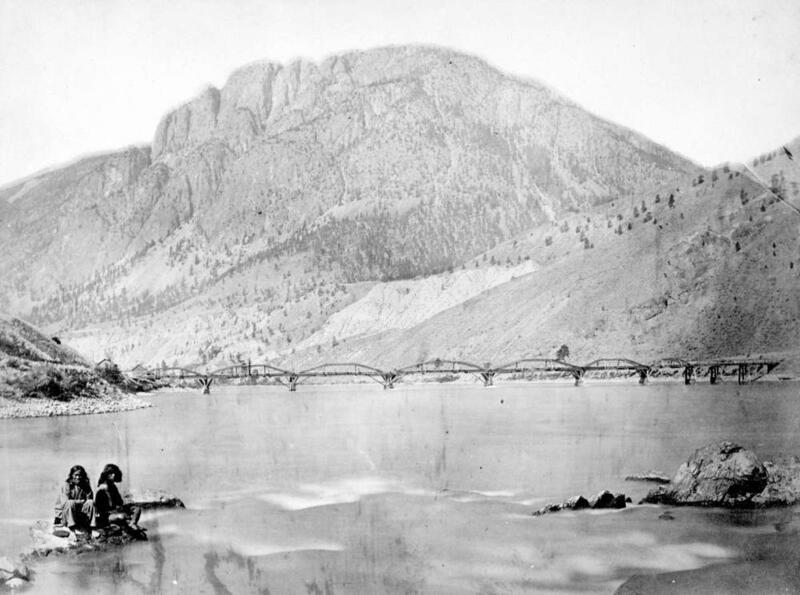 Item A-03570 - Spences Bridge, Cook's ferry, where gold was first discovered. Negative created by Carlo Gentile, print created by Frederick Dally.